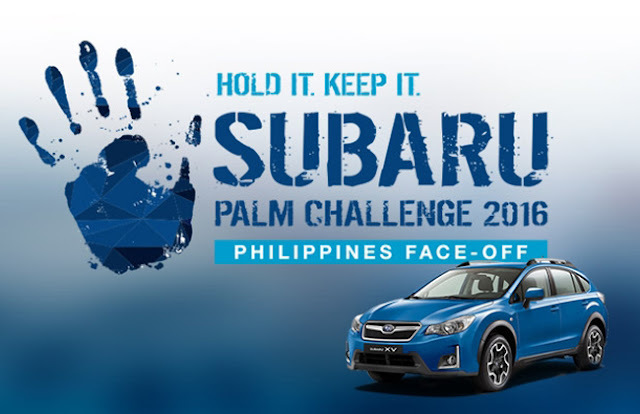 Subaru Palm Challenge 2016: Philippines Face-Off ~ Philippine Freebies, Promos, Contests and MORE! After its previous success, the Subaru Palm Challenge 2016: Philippines Face-Off is back to dare if you can hold and keep it to the end. Participate in any of the provincial legs (Manila, Cebu and Davao) and start registering online or personally at the participating Subaru offices nationwide. There will be a total of six (6) challenge cars with 40 contestants each car for Manila Leg and three (3) challenge cars for Davao and Cebu. All you have to do is place your palm on your assigned palm decal on your designated vehicle. Your palm must remain flat on the vehicle surface and you are not allowed to lift or move it from your decal, except when authorized to do so by Subaru Marshalls. From all participants, only 8 challengers from Manila and 1 each from Cebu and Davao will continue on and represent the Philippines in the Subaru Challenge 2016 (regional contest) in Singapore. There, you will be joined with finalists from 9 other Asian countries and compete for the grand prize, a spanking brand new Subaru XV 2.0i worth P1.3 million.